In the not too distant future, after the placement of high-speed Maglev trains, the North-Eastern states have formed an interconnected, almost continuous mega-state. 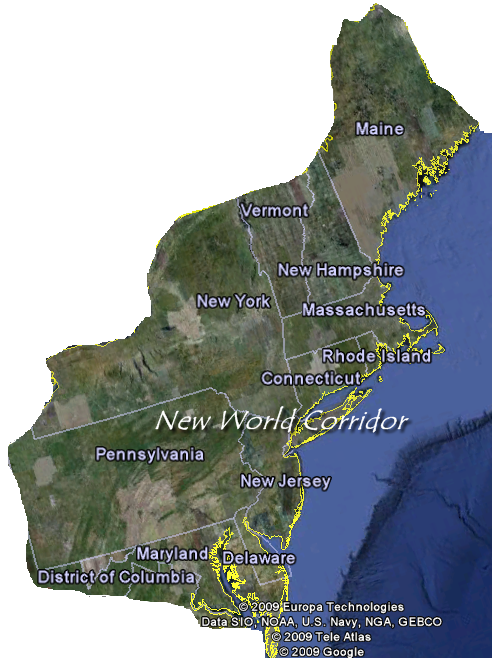 This megalopolis consists of Maine, New Hampshire, Vermont, Massachusetts, Rhode Island, Connecticut, New Jersey, New York, Washington D.C., Delaware, Maryland, and Pennsylvania. These states are collectively referred to as “New World Corridor”. Each state still functions on its own, but with secondary capital in New York that governs the collective Corridor.